Variety of grape variety Traminer; look there. Savagnin Blanc (in France) or Yellow Traminer, White Traminer, Traminer (in German-speaking countries): The French name (also short Savagnin) is mostly given in international sources or grape variety catalogs. Whether it is actually the White Traminer or the Gewürztraminer is not always unequivocal. This variety is characterized by odorless, yellow-green berries. Gewurztraminer or Red Traminer or (especially in France) Savagnin Rose Aromatique: The German name (in English-speaking countries often with "u") is, surprisingly, internationally common. This most common variety is characterized by aromatic, reddish / orange berries. Savagnin Rose or Klevener de Heiligenstein or Savagnin Rose Non Musqué: This non-aromatic variety with reddish-brown berries is rare; it comes almost exclusively in French Alsace in front. In German-speaking countries, the name or variety is hard to find. In German-speaking countries, the sources mostly distinguish between the two varieties: White Traminer or Yellow Traminer and Gewürztraminer or Roter Traminer. 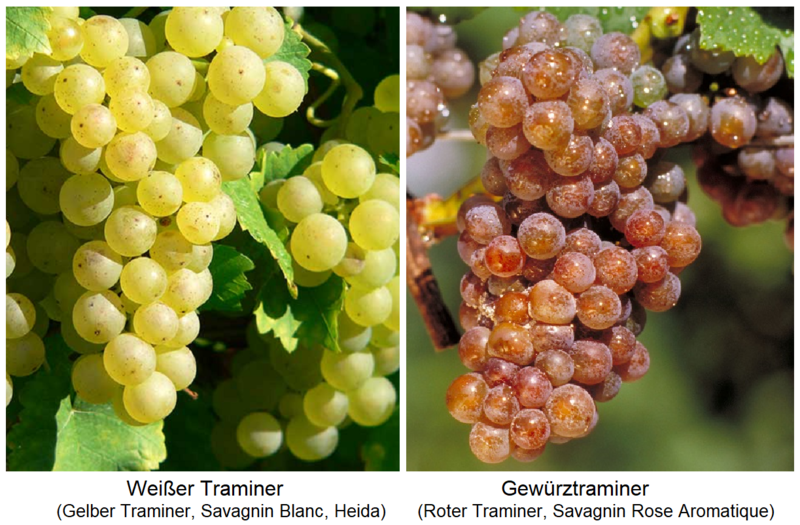 If only the name Traminer is given, it is mostly the Gewürztraminer, but it can also be the white / yellow Traminer meant. For the two varieties Gewurztraminer and Savagnin Rose There are own keywords with additional information. The approximately 200 Synonyms in countless languages are record and prove the old age and wide distribution. In most countries there is no separation in the recording of varieties, but these are usually reported together. The following synonyms are commonly used as a generic, neutral name for Traminer or for the white / yellow variety, but also confusingly for all varieties (there is no unique assignment). The most important alphabetically grouped by country are Adelfrank, Edeltraube, Frankish, Frennschen, Frentschen, Klevner, Rotfrensch, Weißfrennschen ( Germany ); Noble White, Whiteedler ( Alsace ); Beaunié, Fromenteau, Fourmentans, Gentil Blanc, Naturé, Naturel, Sauvagnin, Savagnin Jaune, Savagnin Vert, Viclair ( France ); Traminac ( Croatia ); Klevner ( Austria ); Heida, Païen ( Switzerland ); Brynšt, Drumin, Prync, Tramín Bíly ( Czech Republic ); Traminec ( Slovenia ); Old German / German, Malvoisie ( South-Tirol ); Formentin ( Hungary ). The specific synonyms for the two varieties Gewurztraminer and Savagnin Rose are listed there. This page was last modified at 15 January 2018 at 12:24.